Resignation is synonymous with recruitment. Every person has to resign from one company or post at some point in professional life for better opportunities and scaling new heights. 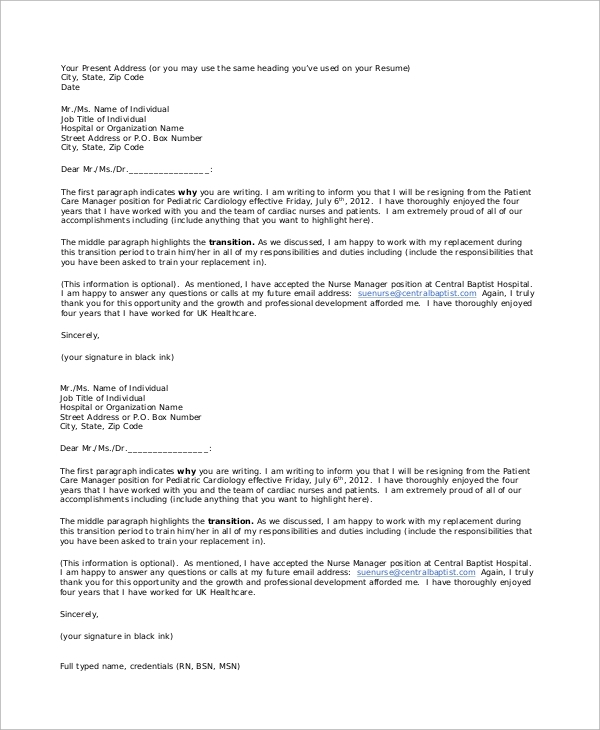 Resignation letters vary a lot depending on the reason for resignation and similarly the tone and style of writing vary accordingly. 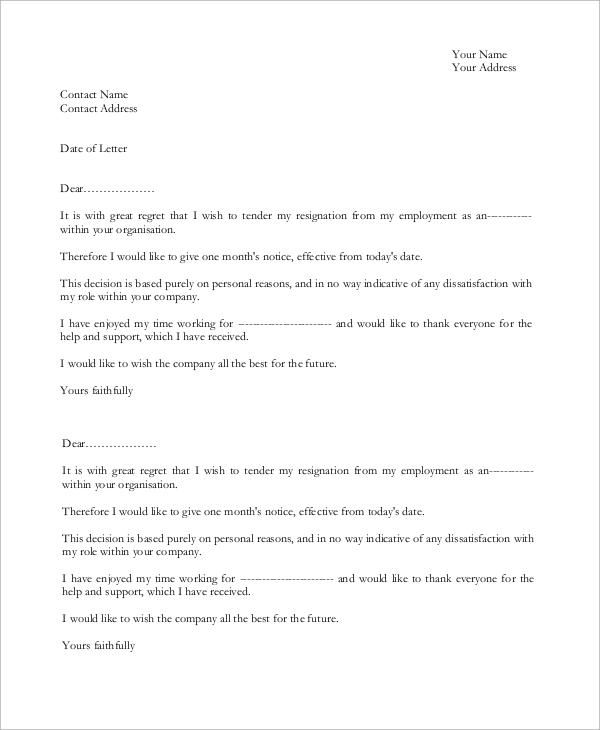 The following Sample Letters of resignation contain the perfect template, tone and sample statements around which an employee can form his or her impactful resignation letter. This is a Sample Resignation Letter whose tone is a little personal. It explains everything with a regretting tone to show the importance of the job to his/her present life and future endeavors. 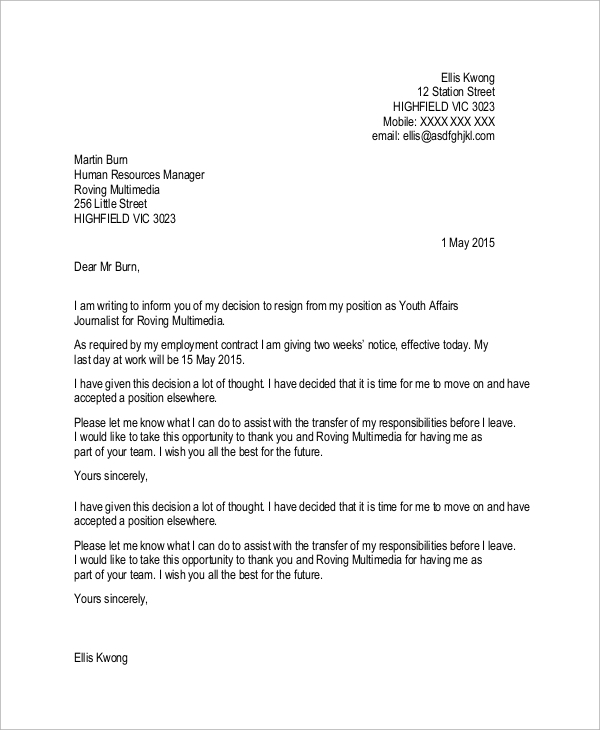 These types of resignation letters are written to resign from a job due to unforeseen circumstances. This is a complete resignation letter with guidelines to be furnished to the hospital authorities. It explains its importance and under what circumstances it should be written. 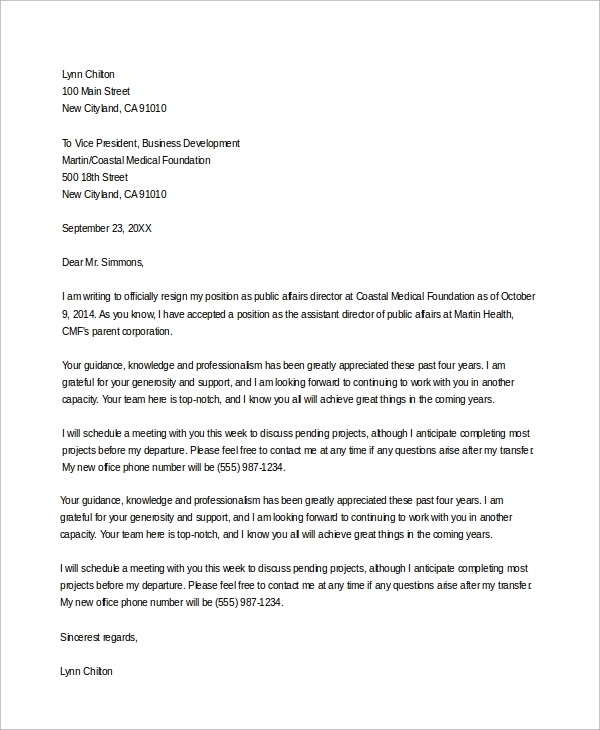 It provides a perfect template with sample statement to write an impactful resignation letter. 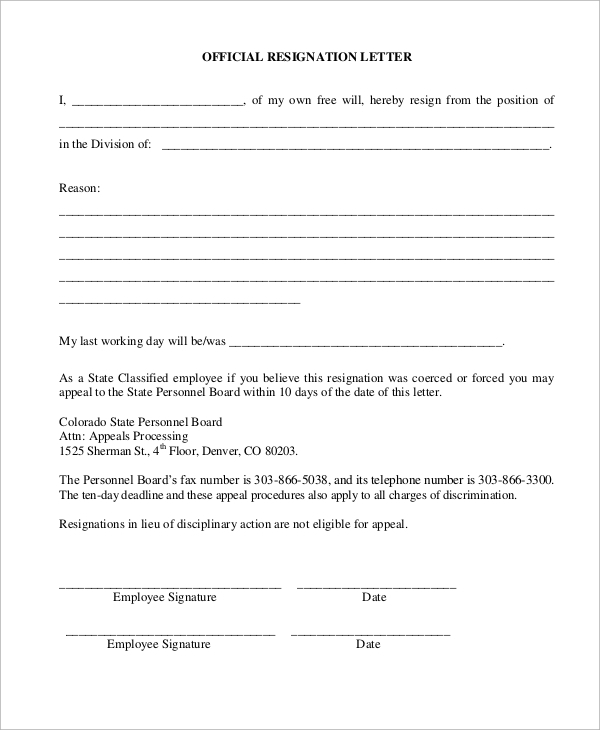 This Sample Letter of Resignation can be used to get transferred to a new post with new responsibilities within the same company. It is just a formal letter because a person cannot hold two posts of different responsibilities and empty the previous post for new appointments. 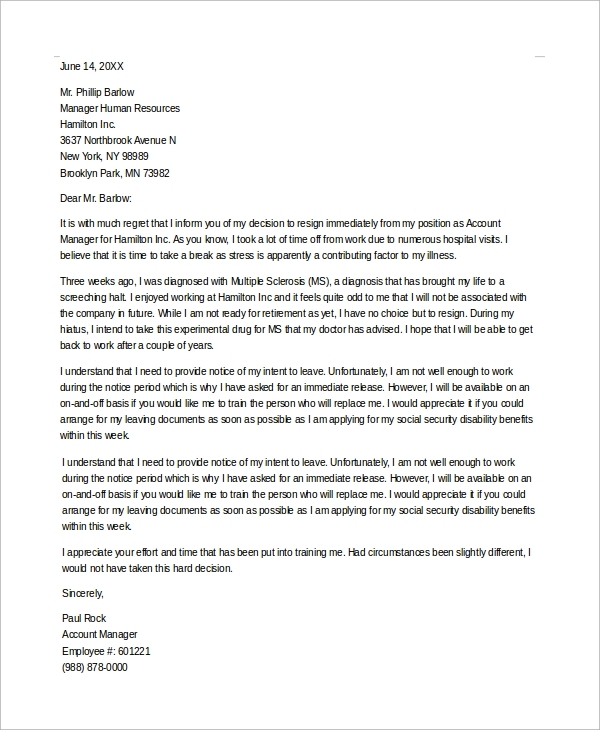 Resignation Letter Samples are formal letters that are furnished to the companies before quitting it. Through it, you are making it official and also maintaining a good relationship with the management for future opportunities. There are different reasons for which people resign and hence, there are different types of resignation letters which need samples to write properly with proper guidance. The above-listed sample letters have all the required ingredients, and you can write a stunning and impactful resignation letter that will leave a long impression. This is an immediate resignation letter due to health reason, and it is written in a regret tone. It is needed when the recovery time of the employee is more than the company’s policy permits. It states the medical condition and period to recover and other necessary information. 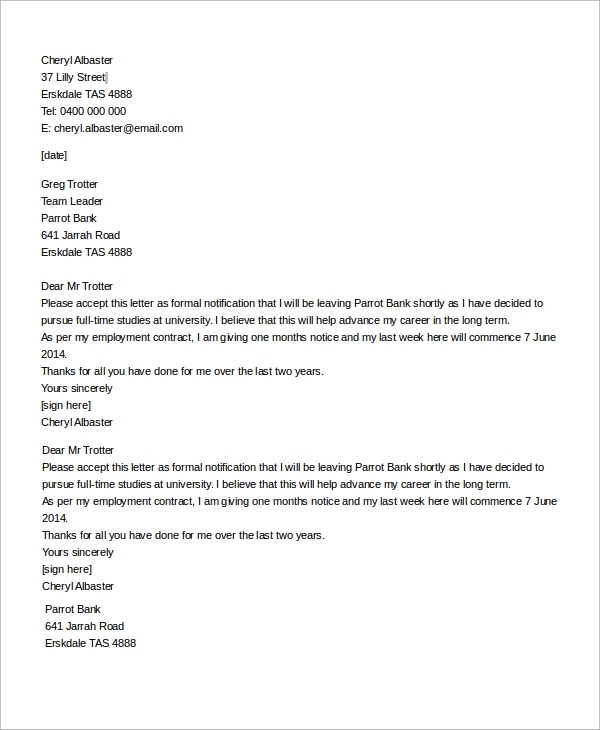 This is a resignation letter for those who want to leave their jobs for further study. The letter clearly explains the reason and also talks about an opportunity when the education gets completed. It helps to maintain a good relationship with the company and management. 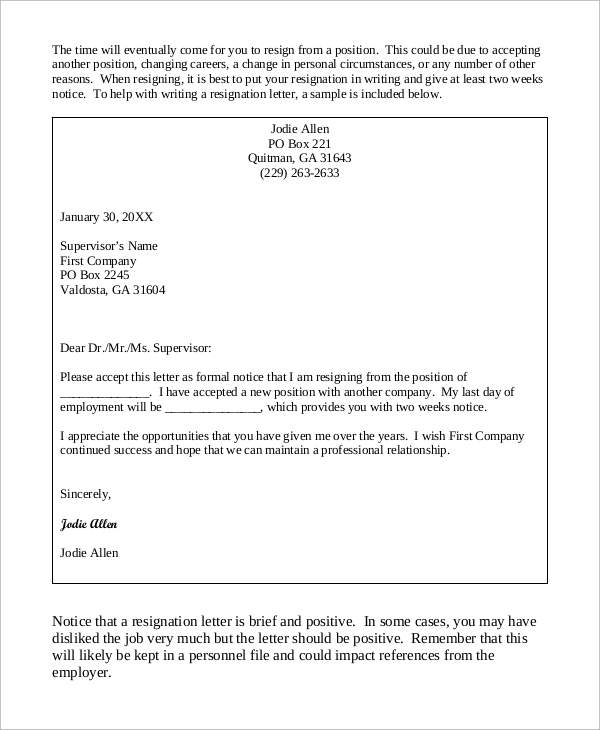 The targeted audiences for the Example Resignation Letters are obviously the ones who want to resign from their current job and want to switch companies with better future prospect and opportunities. It is also applicable for those who are getting a promotion to a new post and leaving the old ones. 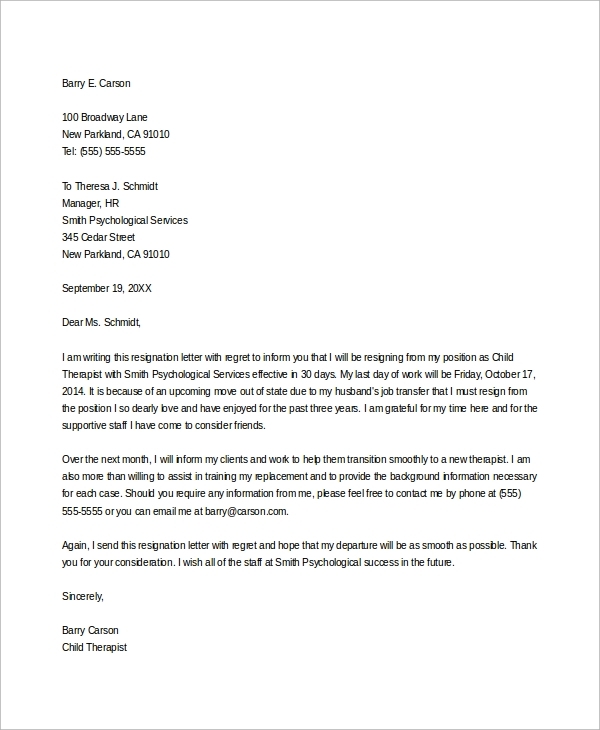 Those who are leaving for a medical reason, these sample letters will come handy for their parents or friends to write the resignation letter on their behalf. The above-listed sample letters of resignation cater to different categories of resignation such as for retirement resignation letter, email resignation letter, Resignation Letter with 2 Week Notice, for further education, for getting transferred to new posts and so on. The tone and writing styles are something to understand and the format.